A Chief Administrative Officer holds considerable decision making power in an organization’s decision making hierarchy. For marketers who wish to promote their products, solutions or services to this highly influential set of business executives, Blue Mail Media’s CAO Email Database can be their greatest resource. Our database provides marketers with complete access to all the marketing information that you may need to connect with CAOs in different countries and industries around the world. 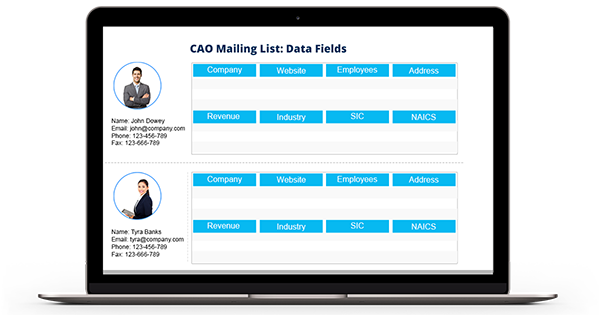 Blue Mail Media’s CAO Mailing List allows marketers to connect with their audiences via multi-channel marketing modes such as telephone, email or mail. We follow a strict process to maintain the quality of our database throughout the collection, verification, organization, and update of our databases. Furthermore, we give our clients the flexibility to get their lists customized based on specific parameters relevant to their business. They can also avail our pre-packaged list of CAO Email addresses. Over the years, Blue Mail Media has been able to establish a strong data partners network, that allows us to serve clients in a global yet local way. Our CAO Email Database has been designed to help you achieve greater response rate and conversions on your marketing campaigns.